Parental consent can be given in many ways. How do we use a social media’s strengths to build trust between parent/guardian and teen? Educating the child about privacy, and the parent about the child’s social behaviours. VIDI is a fictional live video sharing platform aimed at young people. Teens can stream live video from their phone and are alerted to their friend’s live broadcasts. They can also browse popular live streams. You also need to be 14 to use the platform. Always on Geolocation to find nearby video streams and to broadcast your location while streaming from your camera. Your email address, telephone number, age and full name. Teens are generally extremely aware of online safety because it's taught as part of the curriculum in schools, but they may need reminders of data transparency and trust while they use digital services. A particularly tricky challenge when designing for young people is involving an adult in the process of giving consent. What kind of interactions might arise between adult and teen as a result? While using the VIDI app, our parent/guardian and teen have agreed to restrict video sharing to within their home and friend’s houses. Outside of these boundaries lies trickier decisions about the suitability of the video subjects and privacy concerns around sharing locations. 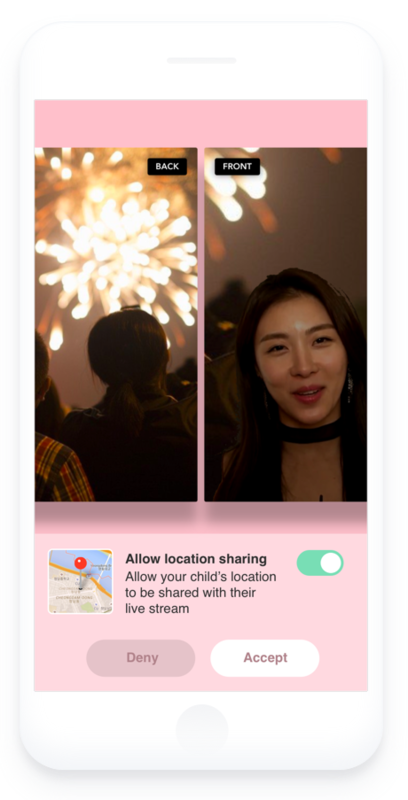 If the teen decides to share a live video in a restricted area while the parent isn’t around, the parent could be alerted with a popup message to agree/disagree with the teen’s choice. We acknowledge that some decisions are not so black and white, and why use a binary choice when we could embrace the medium of video to allow the decision to be discussed? Enter the seamless video negotiation tool. When the teen hit’s broadcast live they effectively call their parent/guardian. The parent/guardian can see what they are about to broadcast using the back camera while chatting to their teen using their front camera. If the parent/guardian agrees, they video will return to broadcast mode and continue where they left off. The parent/guardian can also have more granular controls of their teen's privacy, including geolocation, sharing circles and time limits. There are some obvious workarounds that a child may perform to obtain permission, like showing their parents something more innocent before turning the camera to something more dubious. There is also a time critical attribute to gaining consent as quickly as possible. Recognising a social platform’s strengths is key to designing the most appropriate solution. If consent solutions can be embedded seamlessly, with little effort from the user, then parents and teen can both feel at ease.